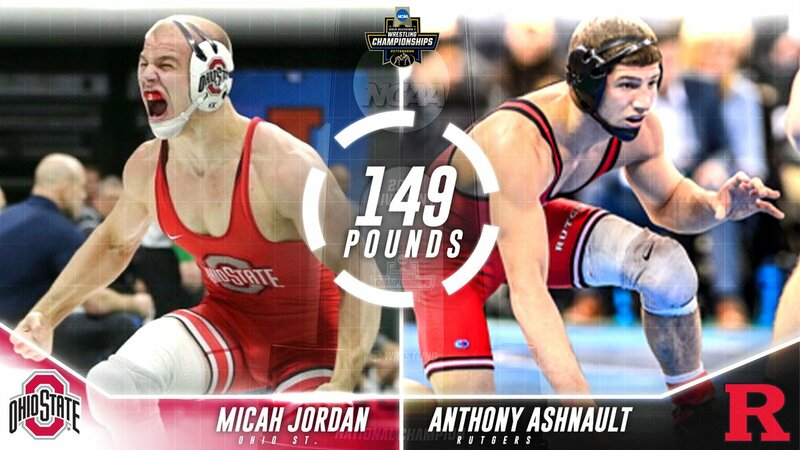 Three of Ohio State's semifinalists will compete in the championship match at the NCAA Wrestling tournament in Pittsburgh Saturday. Joey McKenna, Micah Jordan and Kollin Moore each won their bouts, while teammates Luke Pletcher and Myles Martin came up short late in hard-fought decisions. Despite advancing three of his top wrestler's to the tournament's last round, the pain of Martin's loss was evident on the face of Buckeye head coach Tom Ryan's face as he talked with reporters after the match. "Myles...it was just heartbreaking," Ryan told Eleven Warriors. "I don't know where God's plan is in this – it's tough right now to make sense of it all. But he'll bounce back tomorrow. He loves the University, he loves the program and tomorrow he'll bounce back and take third." Martin went wire-to-wire as the No. 1 wrestler in the country at 184, and was a perfect 23-0 heading into a match with Dean that fans and most analysts thought was a layup given the previous matches between the two. The gimmie wasn't, however, as a late tie-up that seemed to last for eternity ultimately broke in Cornell's favor. Dean understood the enormity of the situation, giving Martin credit for his incredible record as a Buckeye. "He's awesome," Dean said of his fallen opponent after the match. "He's got great attacks, super athlete, very technical and we realized we need to get him moving more, more fakes, more snaps, even if I'm not scoring early on and see if we can get into a scramble position later because I think that might be one position that might be to my advantage." Martin and Pletcher will wrestle Saturday morning for a ticket to the third-place matches. While Martin's loss was a punch to the gut for Buckeye fans who came to PPG Paints Arena with hopes of seeing at least four and maybe five Buckeyes advance to the finals, three of Ohio State's heavy hitters came through when it mattered. McKenna was the first Buckeye to punch his ticket to the NCAA finals, upending Penn State's No. 3 Nick Lee at 141 pounds. The 3-time All American couldn't put any points on the board through the first two periods of the match, but he held Lee to just a single escape point while accumulating more than a minute of riding time. Things warmed up in the third, however, as he scored the only takedown of the match to ahead 3-1 after his own escape to start the period. Although Lee would escape and get a point awarded on a McKenna stalling penalty, the riding time gave the Buckeye the 4-3 decision and a shot at his first NCAA title. He'll wrestle Cornell phenom Yianni Diakomihalis Saturday night for all the marbles. Yianni got the better of McKenna in Ithaca a month ago, but McKenna and the Ohio State coaching staff felt like that loss was an incredible learning experience and could be the key to McKenna earning the final victory in Pittsburgh. McKenna's fellow senior captain Micah Jordan punched his ticket in the very next match, earning his own chance at a revenge match with a familiar foe. Jordan faced the No. 6 seeded Austin O'Connor of North Carolina in the semifinal match, handing the Tar Heel his first loss of the weekend in a 7-4 decision. The Mongoose took care of business, but like McKenna it took him a bit to get on the board. After a scoreless first period, Jordan picked up two takedowns in the second period to hold a 4-3 lead going into the final frame, and then added a reversal and the riding time bonus to set the final score. Jordan will get one last shot to upend No. 1 seed Anthony Ashnault of Rutgers. Ashnault is Rutgers' first-ever four-time All American, and owns a 2-0 record over Jordan, including an 8-6 decision in the Big Ten Championship bout two weeks ago. In the final Buckeye semi of the night – and mere moments after he watched Martin lose a heartbreaker in the final seconds – Kollin Moore turned on the jets and put his opponent away. Moore is known for being an emotional wrestler, and he used Martin's upset as fuel to his fire in a positive way Friday night. The Mountain Man shot early and often, putting the first takedown on the board off the opening whistle. Oklahoma State's No. 3 Preston Weigel couldn't muster any offense against the No. 2 seed, and Moore would tack on four more throughout the match for good measure. With escape points and riding time aplenty, he finished with a 12-4 major decision and will wrestle in his first NCAA final. "Kollin was fantastic, I think he was galvanized quite a bit by the Myles loss," Ryan said after the bout. "That was a manly way to handle it...it's very easy to have that cause chaos in your mind before you walk on the mat, but he reeled it in and it galvanized him." He'll face Penn State's Hodge-Trophy favorite Bo Nickal, the top seed in the bracket. Nickal will be a heavy favorite given their previous meetings this season, but Moore isn't giving up yet. "He's a unique wrestler, exposing people for their mistakes and I think my mistake at Big Ten was I was too focused on not making mistakes," Moore said of Nickal. "I didn't fight him in a lot of positions and that bothered me more than getting pinned in a minute and a half the first time." At 133 pounds, Luke Pletcher couldn't pull off an upset of the top seed in the tournament. Daton Fix of Oklahoma State rolled into the tournament with a 33-1 record as a redshirt freshman, and he rolled through the field over the tournament's first two days. Fix looks like legendary Cowboys coach John Smith's latest world-beater. That's not just hyperbole, as the NCAA finalist literally beat the rest of the world as the 2017 Junior World Freestyle Champion. Things got off to a rough start for Pletcher, as Fix struck first and showed that he is an absolute hammer on top. He got both boots in – fitting for a Cowboy – and worked Pletcher's left arm almost to the breaking point. The huge bank of riding time was too much for Pletcher to overcome, as his late-match takedown pulled him within a point of Fix, but the riding time bonus put the match out of reach and Pletcher dropped the 4-2 decision. He'll wrestle Saturday morning for a berth in the 3rd-place match. In Blood Round action, Te'Shan Campbell was on the cusp of making his first All America podium, but couldn't seal the deal against No. 7 Isaiah White of Nebraska. After wrestling two consolation bouts like a man possessed in the afternoon session, Campbell was a rideout shy of advancing to the placements in his fourth and final NCAA tournament. With his departure from the tournament and Martin's shocking upset loss, Ohio State's nascent hopes of catching Penn State in the team race moved right to the edge of mathematically impossible. The defending champion Nittany Lions did not lock up their eight title in nine years Friday night, but they're 32 points ahead of Ohio State heading into the tournament's final day. Placement round matches begin start at 11 a.m. Saturday and will air on ESPN U. The championship matches will air live at 7 p.m. on ESPN.